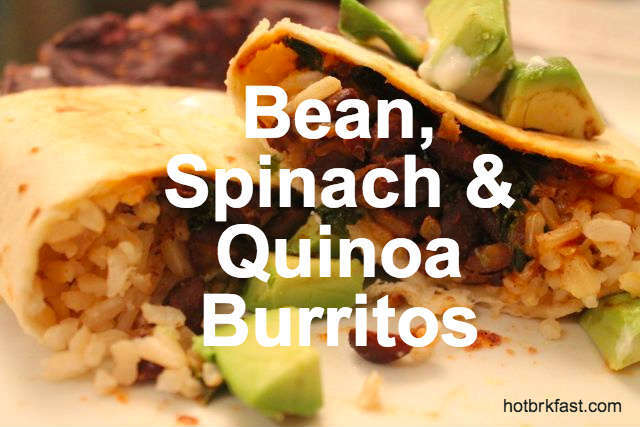 Browse: Home » 2014 » July » Souper Tuesday: Burritos, baby! I had no intention of writing a Souper Tuesday post today. I did write this afternoon – for the first time in a couple weeks – but it was a recap of our recent trip to Illinois and Wisconsin, which I thought would be the easiest way to break out of my no-writing rut. Dinner planning tonight was done in that time-honored tradition of standing in front of the half-empty fridge, then staring into the over-stuffed and painfully disorganized pantry (Pat recently installed the organizers he bought me for Christmas, but it’s actually made it harder for me to find anything), mentally flipping through the recipes my kids will eat. This is a recipe I’ve made several times before, but I modified it tonight to use what I had on hand. Instead of pinto beans, I used black beans. I subbed some lonely kale (chopped) for the frozen spinach. And leftover brown rice from last night’s dinner (this great Pinterest find) stood in for the quinoa. 2. Meanwhile, heat the oil in a large skillet over medium heat. Add the onion, 1/2 teaspoon salt, and 1/4 teaspoon pepper and cook, stirring frequently, until softened, 3 to 5 minutes. Add the chili powder and cook, stirring, until fragrant, about 1 minute. Add the beans, broth and garlic and simmer, stirring occasionally. Roll up into burritos, wrap in heavy-duty foil. To serve immediately: Bake the wrapped burritos on a baking sheet at 400 degrees F until warmed through, 15 to 20 minutes. Serve with the salsa, sour cream and sliced avocado. 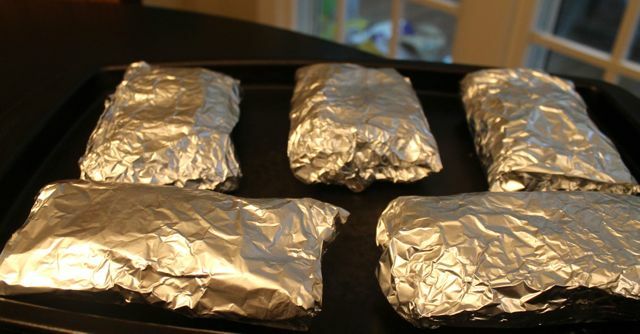 To freeze and serve later: Freeze the uncooked wrapped burritos in freezer bags for up to 3 months. To reheat, remove from foil and microwave until warmed through. Maybe I’m alone on this, but I had never thought to warm burritos in the oven before eating them. I would just warm the tortilla, wrap and serve. What a difference putting them in the oven makes! The cheese melts a little, the filling get nice and smooshed together and the tortilla gets just a touch of crispiness. Here’s the best part: while tonight I only had enough to make half, the original recipe calls for 8 servings – for many of us, that’s enough to eat half now, and freeze the rest for later. And really, is there anything better than a freezer full of burritos? It turned out to be the perfect recipe for tonight. It had been storming all afternoon, and I’d put the kids in front of “Daniel Tiger’s Neighborhood” and started chopping onions when Pat texted that he was going out for drinks with his director after work. If I had been making a more time-sensitive meal, I might have texted Pat a teeth-clenched “fine” and then started crying into my cutting board. But with this (and the thunderstorms sparing the power, and with it, Daniel Tiger) no problem. I wrapped the burritos in foil, stuck them in the fridge, then put them in the oven when Pat was headed home. There’s one burrito left over, so now the only question is who will get it for lunch tomorrow. I might have to call cook’s prerogative on this one. ← Wordless Wednesday: Us – We’re Just Like Stars!